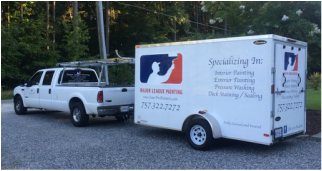 ﻿"Very professional and excellent painter (great pricing). He was on time and very personable. The finished product looked great, he didn't rush the job; he took his time on our half bathroom and even did a couple of other touch ups around our house for us. We will def. use him again in the future. My wife and I would highly recommend Anthony for any service he provides. A++++" - Justin H.
"Anthony is a professional, very personable, and does great work. He painted our interior lower level of a single family home in three days - to include a tall vaulted living room and many bends/corners with french molding. He was meticulous and all edging looked great. He showed up at exactly the time he said he would each day and was very reliable in getting estimates and final costs when he said he would. His price was better than all other competitors from whom we received estimates." - Mitch E.
"Anthony did such an excellent job on my home. There were numerous different colors on my walls and plenty of patchwork to be done. My house looks great. He was very kind and extremely professional. If I ever need painting done again, he will be my first call." - Tisha T.
"The quote was awesome, but more importantly, the work was IMPECCABLE! You can tell this company takes pride in their work and they value perfection. We are so happy with the final outcome." - Jana M.
"Anthony did a wonderful job painting our new home. He did all patchwork, painted all trim, ceilings, and walls. Finish product looks amazing! Couldn't be more satisfied." - Jo B. "Anthony arrived exactly at the time he said he would and was friendly, professional and courteous. He took time before starting to explain exactly what he would be doing and patiently answered the questions I had. He worked efficiently throughout the day, cleaning up along the way. When he was done with the job, Anthony brought me to each area he worked on so I could inspect and approve. I would definitely recommend this company to anyone looking looking for exterior services!" - Jen W.
"Major League Painting painted more than half of our house. We were so impressed with the quality of the work as well as how fast it was done. We will definitely use MLP again!!!" - Melissa R.
"Working with Anthony Franz has been one of the most pleasant experiences! He was on time, professional, kind and did an outstanding job painting our kitchen and bathroom! He removed all outlet covers and replaced them and cleaned his work area as if he was never there. The paint job has completed our downstairs look and we would definitely rehire for any future work. I highly recommend!" - Brittany F.